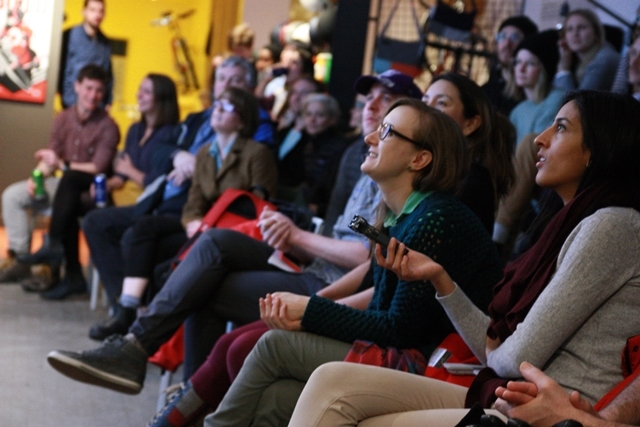 Belonging was the theme of the first BIKE MINDS event on January 17, 2018. 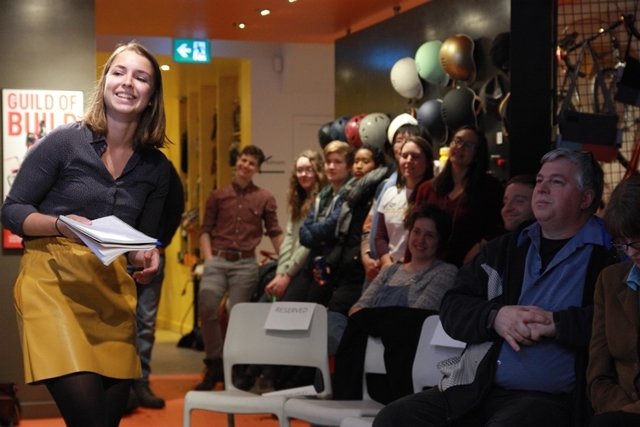 Organized by Matt Pinder and Michelle Kearns, BIKE MINDS is a bicycle-themed storytelling event where guests share inspiring experiences, ideas and research related to cycling. Participants are invited to engage in thoughtful, inspiring, and inclusive conversations around a mutual appreciation for the bicycle. 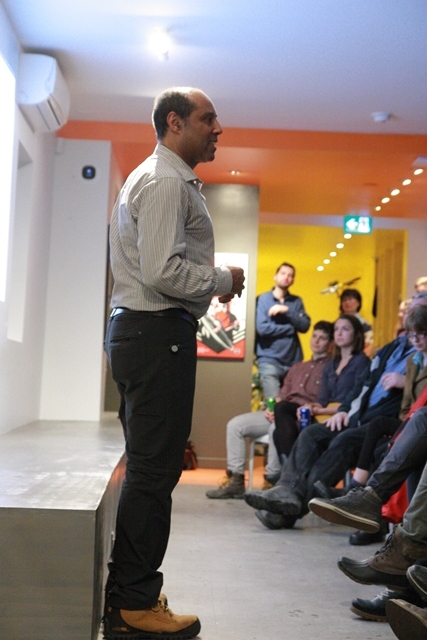 The evening was hosted at Fix Coffee + Bikes, with additional sponsorship from Amsterdam Brewery. This highly anticipated event had a waiting list larger than the venue. Matt’s opening remarks echoed sci-fi author William Gibson: “The future is already here --- it’s just not very evenly distributed.” He set the stage by encouraging the audience to see these stories from this evening projected into creating a happier, healthier, more vibrant and sustainable future. For the first story, recent Canadian newcomer Ping Pang spoke about how the Bike Host program by CultureLink had helped her integrate into Toronto and Canadian culture. She has made many lasting friendships through Bike Host, and cycling has given her the independence and confidence to go where and when she pleases. 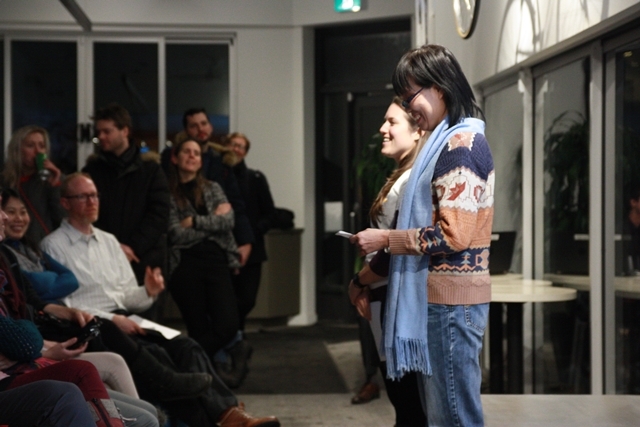 Ping’s Bike Host mentor, native Torontonian Katie Wittmann, told of how teaching newcomers to ride had enriched her life and expanded her culinary horizons. She took us to Bike Host summer potluck picnics, with food and children from all around the world joyfully playing and riding around Toronto’s great parks and trails. Katie also made a special mention of host venue Fix Coffee + Bikes, which donates fixed up old bikes to CultureLink so that newcomers can have a bike to take home. Next, Claire McFarlane, co-founder of the Bad Girls Bike Club, (and also former dandyhorse editor) took us on a ride around Cape Breton island in Nova Scotia. We went up and down the mountains with her, as she overcame everything in her path, from rocky roads to mosquitos to wobbly brakes. With each new challenge, her confidence in her mastery of her bike and the terrain grew stronger. For five years, Juno Stewart took his love to the streets, organizing a family bicycle parade for his neighbourhood north of Davenport. Kids had a great time, riding in the park, decorating their bikes, and banging pots and pans. Grown ups even had a race to see how slow they could go without falling over. He showed us everything we would need to know to organize family bicycle parades in our own neighbourhoods. Erica Duque moved to Canada from Ecuador in 2005, and bikes have become her life in Canada: she is now an Active Transportation Planner for Peel Region. One of her first friends in Toronto took her out to buy a used bike. Their relationship has outlasted that lovely old bike by more than a decade. Biking is how she discovered Toronto --- and now she even loves biking more than she dislikes winter (winter was a new experience for her), so she rides all year round. Chris Spinney and Chelsea Mohler expanded our view of blind people and bikes. They are part of the Trailblazers Tandem Cycling Club, where sighted volunteers ride tandems with the visually impaired. The club provides the tandems and training, and everyone enjoys riding the great ravines and trails in the Toronto area. As with Katie Wittmann from Bike Host, we heard how facilitating someone else’s experiences enriches the soul. Somehow it slipped out that Chris met his partner through Trailblazers, although he was quick to emphasize that it’s a cycling club, not a dating service --- but that nevertheless his is not the only marriage to have originated in the club. Trailblazers has been bringing people together to see a better world through cycling for over thirty years, and is always looking for new volunteers. An enthusiastic round of cheering brought keynote speaker Kyle Ashley to the stage. Kyle transformed Toronto this past summer with his dedicated public service as a Parking Enforcement Officer with the Toronto Police. Historically, Parking Enforcement Officers in Toronto have been deployed with objectives such as maximizing revenue, or reducing congestion (under the Tory administration). Kyle convinced his superiors to let him serve with a different objective: public safety. This transformed not only Toronto’s bike lanes, but also how many citizens relate to the police. Kyle’s message and lived example of kindness also transformed how many people behave on the street --- for the better. 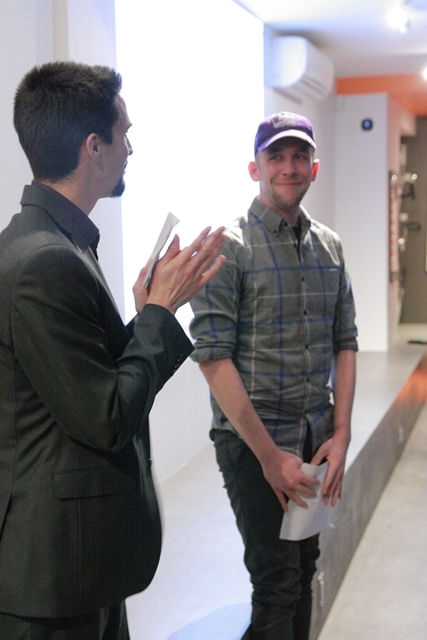 Kyle started with a playful spoof of The Fresh Prince of Bel-Air that had everyone laughing. He took us on his personal journey, of how bikes helped him find a place of belonging through public service. Once, at a time of self-doubt, his doctor advised him to pick up his bike and get pedalling --- advice that the Canadian Association of Physicians for the Environment encourages all doctors to give to their patients. That pivotal moment led him to the amazing summer of 2017, from which we all benefited so much. As many readers know, Kyle is currently off Twitter and off the streets. He has filed a grievance. Kyle’s current situation and work this past summer have been covered extensively by The Toronto Star, CBC, Metro News, The Globe & Mail, NOW Magazine, and, of course, Dandy Horse. He has also garnered positive attention in other cities around the world. 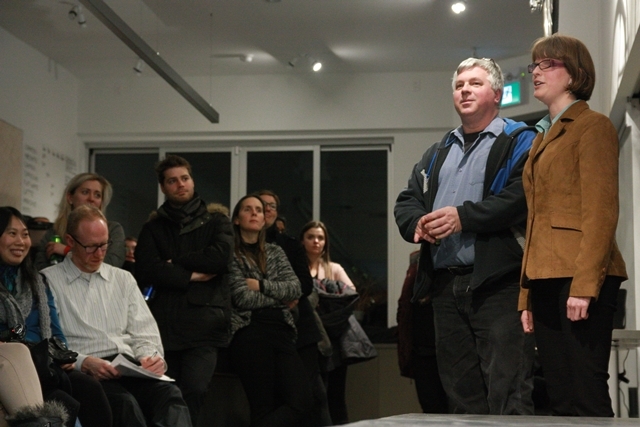 Many audience questions focused on his situation and when he might be back on the streets. Kyle was obviously unable to comment on his grievance file, but one thing he said was surprising: even he does not know the origin of the complaints against him --- not even specifically what the complaints were. David Rider has reported in the Toronto Star that a number of politicians who made proposals that Kyle was critical of have denied filing complaints, including Yvan Baker, Giorgio Mammoliti, and Denis Coderre of Montreal. For now it appears to remain a mystery as to who complained about Kyle’s service and what specifically they were complaining about. 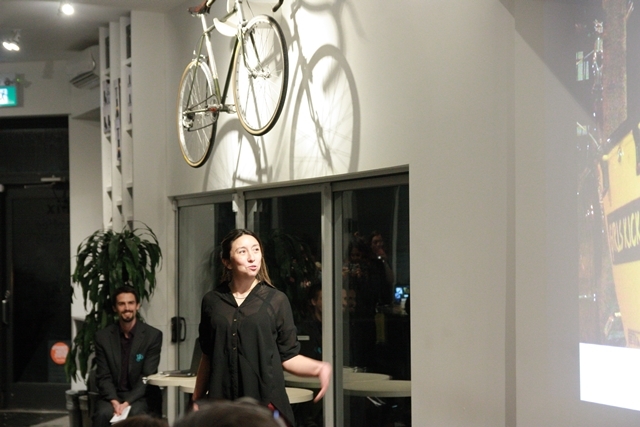 Matt and Michelle created the BIKE MINDS events to share inspiring stories of the transformative power of bicycles. In their day jobs, they both use statistics to analyze transportation patterns, and they understand the vital role of statistics for public policy and infrastructure decisions. But they also know that statistics are rarely a basis for individual decisions, and that statistics do not paint a complete picture of the world. Statistics are good at concisely summarizing the routine and repetitive activities of the present, like commuting, but they typically do not do a good job of communicating transformative human experiences. Stories can inspire individual action and lead to change that is measured by future statistics. Matt talked about The Netherlands in his opening remarks, which is a country that fifty years ago reacted to pedestrian fatalities by making conscious and systematic decisions to improve street design for the safety of all. New York City has similarly transformed its streets over the last decade, improving mobility and safety for everyone. Cities in Canada can choose a similar path, so that our future statistics reflect the present statistics of places like New York and Amsterdam. Sharing stories can help us make those changes. 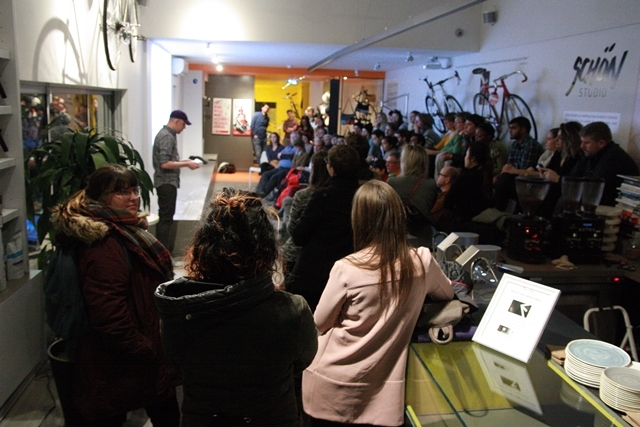 BIKE MINDS will continue on the third Wednesday of every month until April, with a different theme each time. The next event is February 21st, and will share stories of how cycling integrates into different lifestyles. Very well organized and the speakers were amazing! 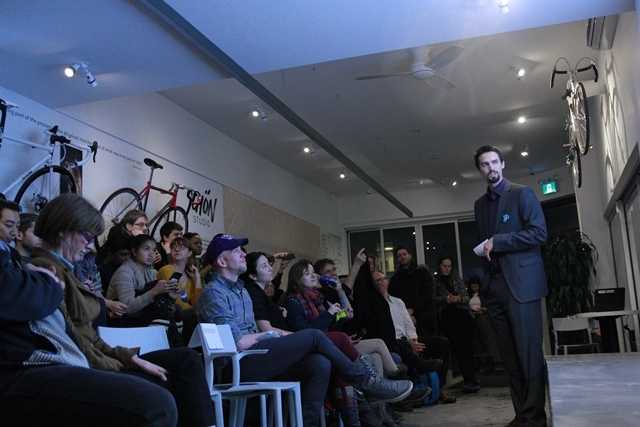 Toronto is full of cycling that works for all ranges, experiences and abilities – Bike Minds really highlighted this with the speakers chosen. If you can make it to the next one, DO! Regarding the Kyle Ashley part of the story, let’s see if I understand this correctly. If a police officer kills someone, James Forcillo killing Sammy Yatim for example, the officer is suspended with pay during the investigation. But if you send inappropriate tweets, you have to take unpaid leave while TPS investigates?? ?